Why The Golden Globes 2018 Is So Important For Women All Over The World, Stat? The Golden Globes is one of the most important awards' ceremonies in Hollywood. You could extend it to the world; but, for now, let's stick to Hollywood. And this year, aside from the fact that the landmark property completes 75 years of recognising veteran and artistic cinema, the Golden Globes. that is set to air on Sunday, at 8 pm IST live worldwide, is going to be a landmark moment for women. It will go down as a historical moment in the making, as the stars descend on the red carpet this year and as actresses, producers, writers and executives will be making an appearance, all dressed in black. The significance of the colour of choice is to symbolise a recent awakening that has taken over Hollywood where women from every segment of the industry are stepping forth to call out sexual offenders who have built their Hollywood empires on the their ability to abuse and exploit their prey. Case in pount (but not limited to): Harvey Weinstein. 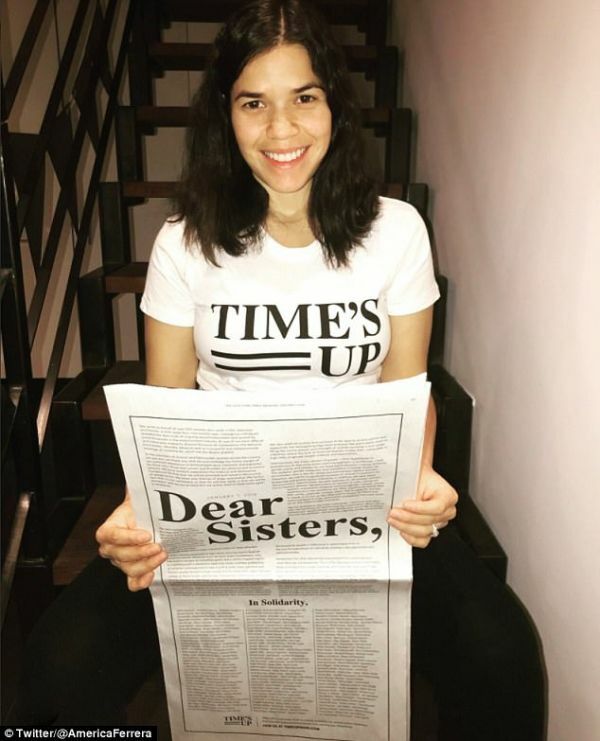 At the beginning of 2018, a community of 300 women from the industry, who are now known as sister of solidarity started an initiative, Time's Up, which was a revolutionary step by these women to call out the predators of the industry, blow the lid on their sexism and stand up against them. It could very well mark the end of a sexual tyranny that has always existed in Hollywood; no doubt, glamourised and well hidden behind and underneath all the glitter, fame and fortune. But, just like everything has a stipulated time, so does the trivialisation and casuality of sexual harassment in an industry which thrives on its women - in every way possible. The new league of women who comprise this initiative have announced various efforts to fight systemic sexual harassment in Hollywood; but intend to make this fight relevant to every other industry and workplace that glorifies and normalises sexual harrassment. And with these efforst comes the solemn request to don the colour of their solidarity at one of the biggest events of the year - The Golden Globes 2018; a place where everyone who is someone in Hollywood is bound to set foot. The community has also come up with one very intricate accessory which will be seen on the red carpet, alongside all the black capes donned by Hollywood. 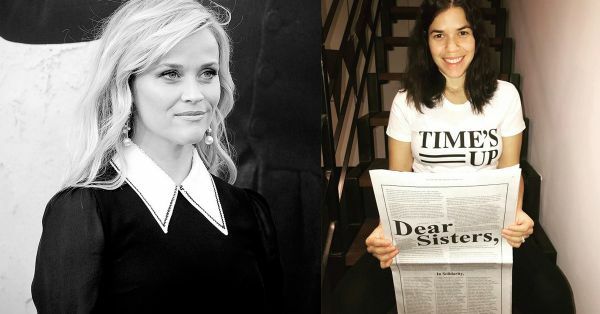 A pin with a black and white logo has been unveiled by the same band and the initiative has been spearheaded by Reese Witherspoon, along with help from well known costume designer and stylist Arianne Phillips, and jewelry designer Michael Schmidt. The logo which took two weeks to be created already has 500 pins ready to be worn, according to Hollywood Reporter. The members also created a legal defense fund to subsidize support for men and women across all industries who have been victims of sexual harassment and, according to CNN, Time's Up has already raised up to $15 million for the fund, as of Friday, 05th January, 2018. 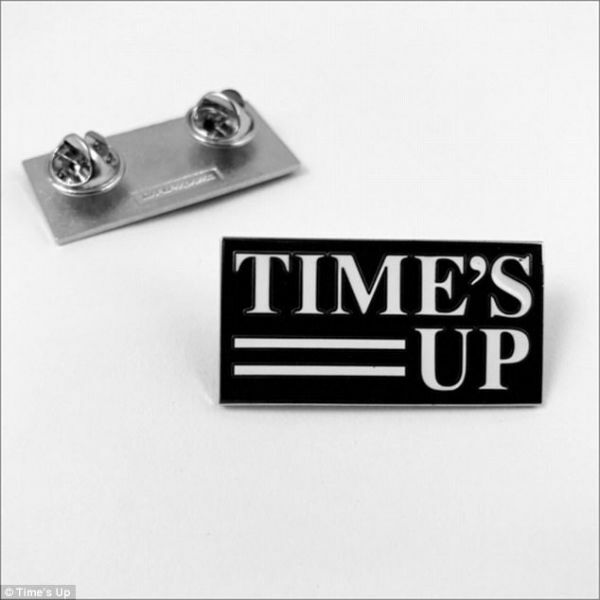 Time's Up includes stalwarts and front running women, like Shonda Rhimes, Meryl Streep, Jessica Chastain, Eva Longoria, America Ferrera and Emma Stone who are bearing the torch against sexual harrassment. The idea behind wearing black is to 'make their protest and their solidarity tangible on screen'. Given that the news already has Hollywood in a tizzy; what with designers already running amuck trying to create looks for every female individual in the industry who will be in attendance of the event on the remarkable night. But, that's not all. This one small detail has the potential to disrupt an industry; albeit just for one night, but, with the potential to leave an indelible impression for centuries to come. It changes the game for all behind the scenes action that garners anticipation and eyeballs way before the event is held. It is also changing reportage of the entire ceremony as The Cut, New York Magazine's fashion segment has announced that they won't be administering rankings for the Best Dressed at the Golden Globes 2018 Red Carpet. “This year, to rank red-carpet looks is to say, Activism looks good on you. Or worse, It doesn’t,” wrote Emilia Petrarca, fashion news writer, The Cut, in an explanation given by the media house for the decision. Furthermore, The New York Times - without directly referencing Time's Up - revealed its plans on red carpet events' coverage on a 'post-Weinstein' era, in a full-page article; just two days ago. “The red carpet is now a prime soapbox to speak out about harassment, sexism, racism, industry practices—as well as Hollywood success—and we want to continue to cover that,” wrote Choire Sicha, the editor of the newspaper’s Style section. This is an important moment in the history of cinema and Hollywood. Women are clapping back and taking back what is truly theirs - the right to be respected for their role in an industry; to be seen as equal individuals who should be applauded for tehir work; not the way they look, or dress. This takes away the power from paparazzi of blindly asking red carpet regulars 'who they're wearing' at an event, and opens up the conversation around equality, sexual harrassment, women empowerment and the huge gender gap in the industry. Sure, it may be too little too late for the women who have already suffered at the hands of men, like Harvey Weinstein. But, it certainly does begin to question the authority and integrity of such individuals and prevents - or, at the very least - teaches many such men that the silence has broken. Women are and will continue to speak up. The chains have broken and the time's up. This is a milestone - for the moment, just for Hollywood, yes. But, it's also a milestone in inspiring women all around the world that it's time to stand up in solidarity for each other and for ourselves. Silence isn't always golden. And freedom of speech and expression often comes in a colour of its won; for now, it's black. ANd it's time we all wore that colour and flaunted it proudly. 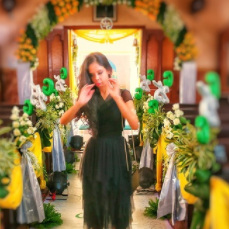 It's true what they say - black isn't just a colour; it's an attitude; that we, as women, will not take any atrocities quietly. this is how it begins. And this is how it ends. So, watch the Golden Globes 2018. Not so much for the awards and the glitterati as much as for the women, the solidairty and for the message to be delivered, and spread across the whole wide world!